Welcome to Re-Decorating™! Our first project is my son Patrick’s bedroom. He moved into this room after his older brother, Tyler graduated from college and before we had a chance to make any changes and update the finishes! Pat told me this summer he wanted a red chair like the one Doc Brown had in Back to the Future. 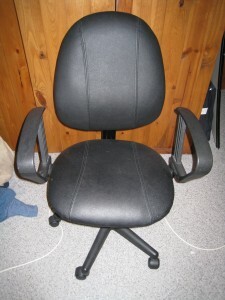 If we are purchasing a new chair it’s time to re-decorate the entire room. Patrick needs a grown-up room! 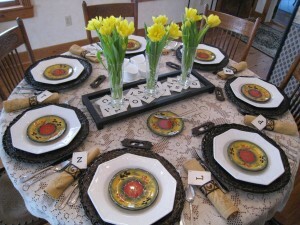 As with all my design clients, I assess which furniture pieces we will keep and what needs to be replaced. Same with accessories and artwork. With teenagers and young adults, personality and interests play a big part in designing bedrooms. 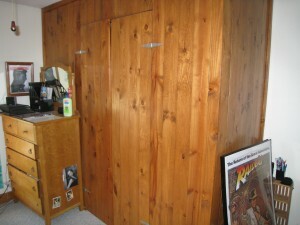 We built the wood closet to look like an original closet in the master bedroom circa 1890's. Patrick is a big movie fan. He collects DVDs and posters. 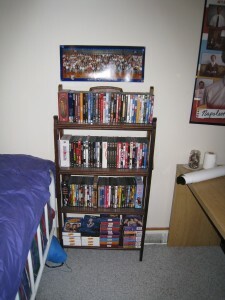 He has an antique wood shelf that is perfect for movies (it’s already full) and a narrow, tall shelf (half full). He has several movie posters and just purchased three Indiana Jones posters this month. The new ones are very large, so we will have to determine if there will be wall space to hang everything. This antique wood shelf folds flat. It's the perfect size for DVDs! 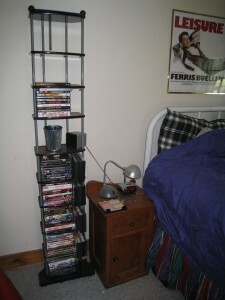 The tall DVD shelf is new (and almost full) and the bedside table is part of an old bachelor's dresser. 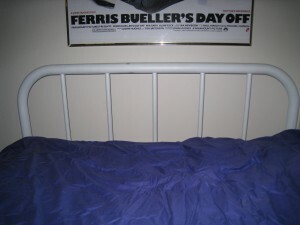 The vintage iron bed frame belonged to my Grandparents, so that will stay. I remember sleeping on it when I was a kid. It brings back great memories of times spent on the farm with my sister and cousins. It will need to be painted. The old iron bed isn't fancy, but has tremendous sentimental value! ...but it does need new paint. 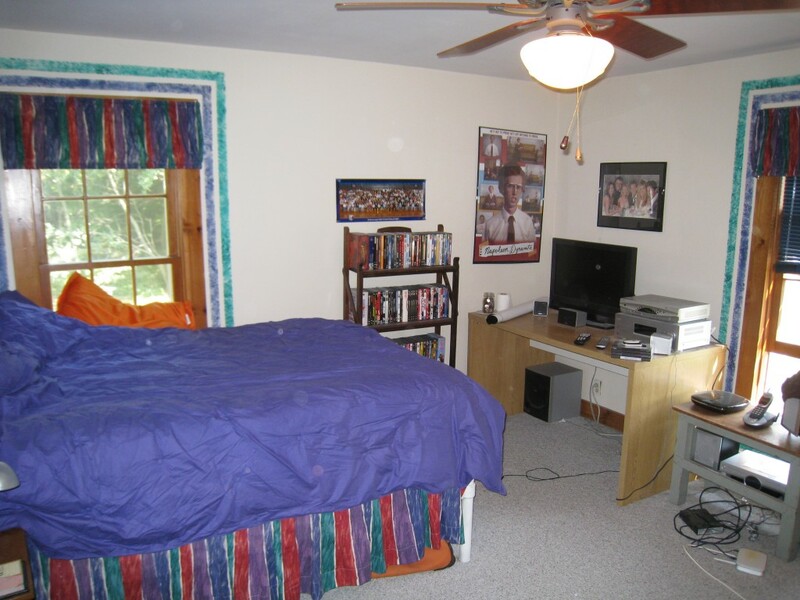 The purple bedspread is only a couple of years old, but may not “go” with the red chair. 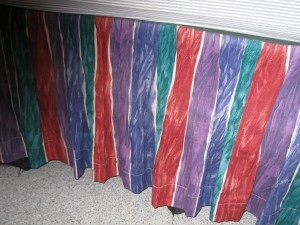 Same with the bedskirt. 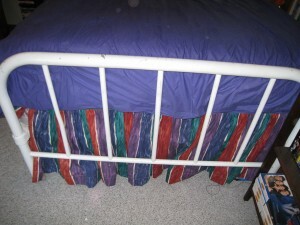 I made this bedskirt several years ago. It's still in great shape and has red in it. Maybe it will still work? 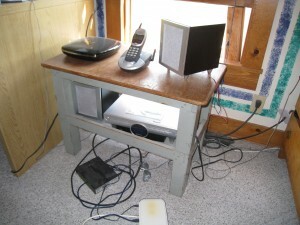 The little bedside table is from an old bachelor’s dresser. 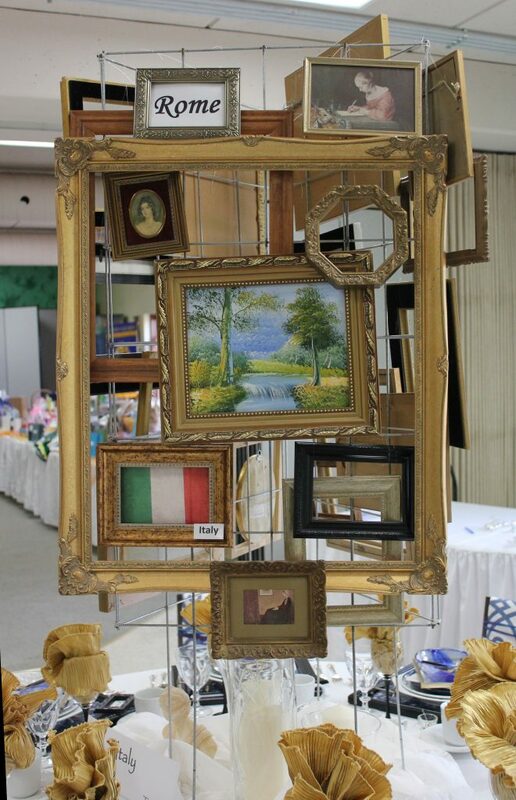 Someone took it apart years ago and sold the pieces separately. It’s a bit low, but it works for Patrick. He likes having the drawer and storage. The bird's eye maple dresser is a lovely antique. 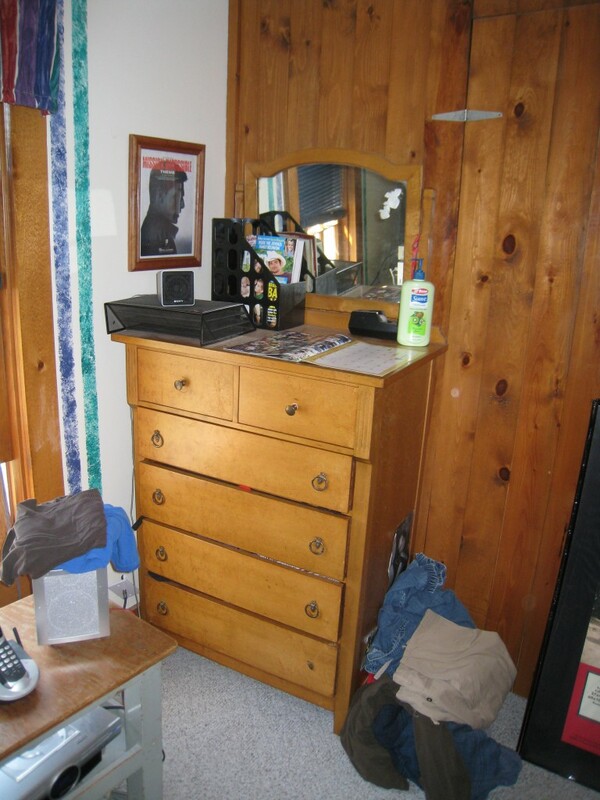 His dresser is an antique and in very nice condition. The desk is nothing special, but serves its purpose so it will stay until we find something better. As with everyone who owns electronics, cord control is an issue. We will have to tackle that problem. 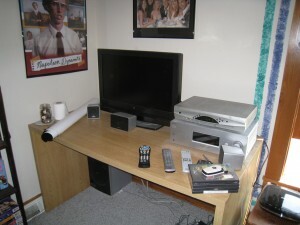 The desk is noting special, but has room for electronics and remotes! Do cords multiply when we aren't looking? This will be the biggest challenge on this project. One of the things I do as a designer is ask my clients how they use the space. 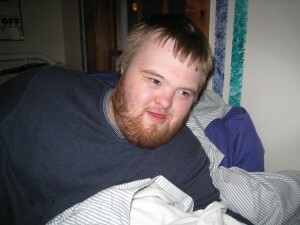 Pat is almost 21, so spends time on his computer and watching TV or movies. He sits on the bed with his laptop facing the desk/TV. He has a desk chair, but never sits on it, so it’s hidden away in his closet for now. I know we can rearrange the furniture to make better use of the space. If he decides he has no need for the chair, it will go. 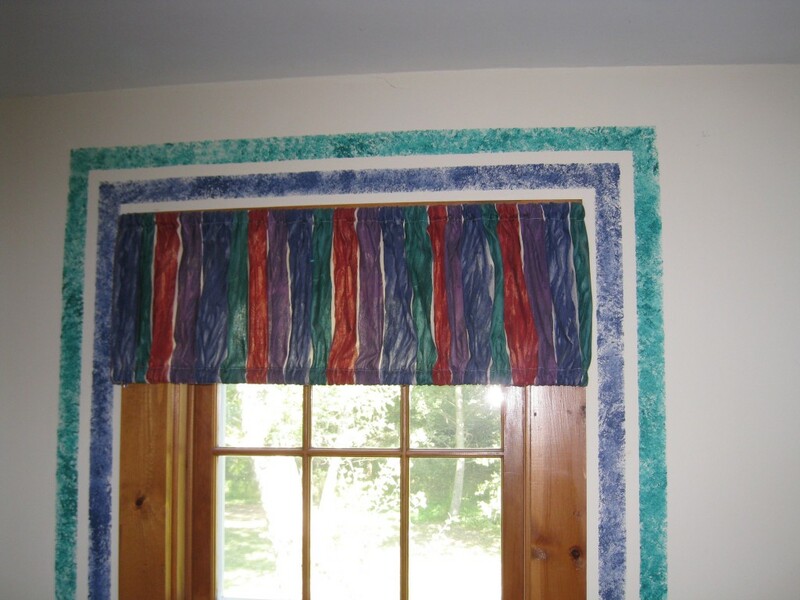 The window valances and painted borders are left over from Tyler’s teenage years. They are history along with the blue mini blinds. 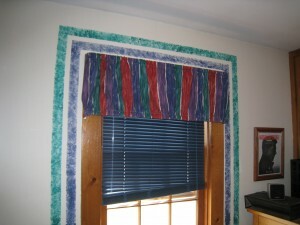 I painted the border to match the stripes on the fabric. It still looks good, but the room needs a fresh approach. Old mini blinds have got to go! The ceiling fan is too big for the room, but we will keep it for now. Pat can probably use a lamp on the desk or dresser. I will figure out lighting needs after the room is rearranged. The grey carpeting is in good condition, just needs to be cleaned. So we have our work cut out for us. Since he is set on getting a red chair that will be our inspiration and the first thing we buy. This will be a do-it-ourselves project. I need to set a date for completion to stay on track. I will plan on Halloween, but be happy if we are finished by Thanksgiving! We definitely have to be done before his birthday on December 3. One thing experience has taught me, everything takes longer than you planned! Love what you’ve done for Patrick!!!! !